The many fragments of Leonardo da Vinci’s manuscripts that have survived to the present day cover an incredible variety of areas and show how far ahead of his time Leonardo was. This collection of his literary work has been carefully translated and compiled to bring out the enormous range of his interests and convey the versatility of his artistic and scientific genius. 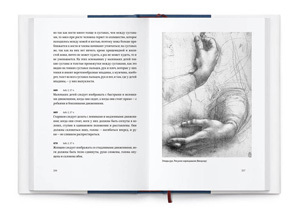 Da Vinci’s writing is complemented with reproductions of the sketches and drawings from his manuscripts, and exhaustive translators’ commentary. Book details: overview and double-page spreads. All studio e-books are published in EPUB format without DRM protection.